In addition to the "Complete fragments" function (already known in Diamond 3) that lets you complete the molecular fragments that had been truncated, for instance during a cell range filling, you can now define packings of molecules much more straight-forward. Define a unit cell or a super cell or any arbitrary parallelepiped of your crystal structure, or a sphere or a slab (a cell range cut by an hkl plane) or a slice parallel to an hkl plane of given thickness as basis for the atoms and use several options which atoms of the molecules are to be included in the packing range: only atoms that fit (which may cut off atoms outside) - or the whole molecule if all or at least one atom fits or if the center or a reference position of the molecules fits. The well-known "Connectivity" dialog where you define, if and how far atom group pairs are to be connected with bonds, has got two additional pages, one for non-bonding contacts and another one for H-bonds. The basic settings are derived from the van der Waals radii sums but can be adjusted individually for atom group pairs or even atom site pairs individually. Like atomic parameters, bond parameters can be defined now with the structure parameters. These "hard" connections between (symmetry-equivalent) atoms of the parameter list eventually supersede the settings made under "Connectivity" (the latter called "soft" connections). They can be input manually but are normally imported via the "_geom_bond_xxx" loop in a CIF file or via the bond section in a molecular structure file (e.g. a MOL file). The same is for non-bonding contacts ("_geom_contact_xxx") and H-bonds ("_geom_hbond_xxx"). There are several options, if and how to consider the "hard" connections in your connectivity settings. The functions to create molecules or to complete molecular fragments have been enhanced in that way that a list of molecular units from the atomic parameter is available to select from. This list is based upon the current settings of either connectivity (a bonding sphere for an atom group pair each) or atomic environments. 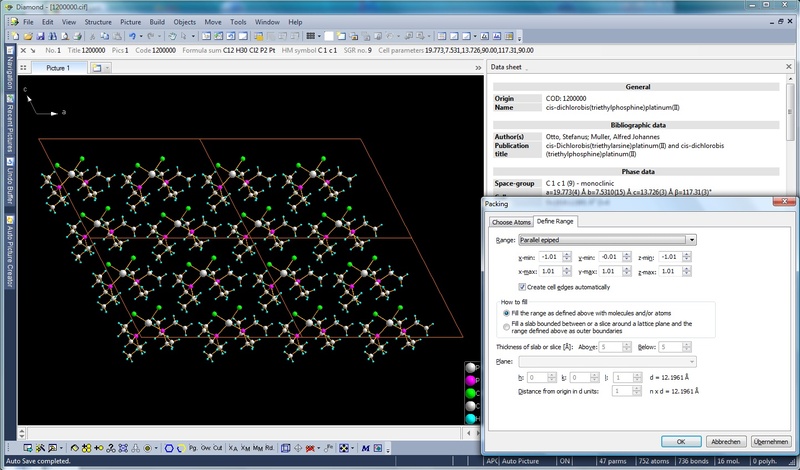 You can define a reference atom within the molecular unit and choose symmetry operations and/or cell translations to be applied to the molecular unit to create your symmetry-equivalent molecules whereever you want to have it in your crystal structure picture. Expand or reduce clusters of molecules by finding neighbouring molecules (usually via connection with non-bonding contacts and/or H-bonds - but also possible with a simple "who's next?" search). You can create these neighbouring molecules directly, or build them up step-by-step from the contacting atoms, optionally using broken-off bonds. Especially for larger molecules or polymers, there is now the possibility to grow or cut molecular fragments or polymers step-by-step - as a kind of missing link between the Diamond 3 functions "Coordination spheres with N cycles" and "Complete fragments". Especially useful for polymers are the new functions to blow up or shrink multiple coordination spheres around selected atoms. 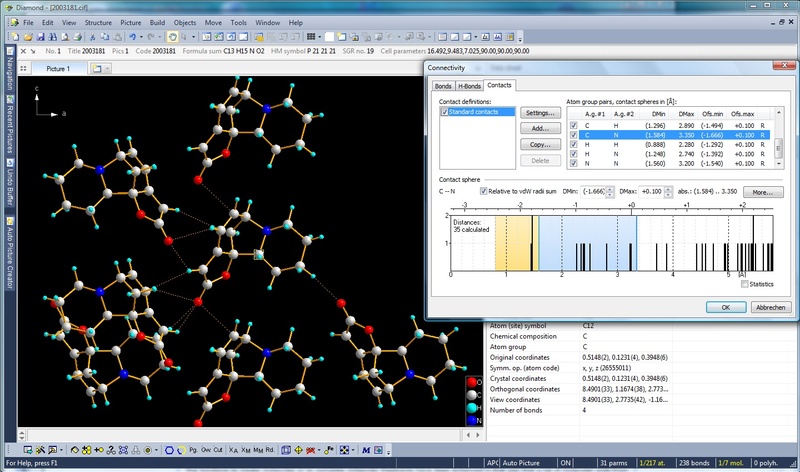 The mentioned functions can be used through commands from the "Build" menu but also very intuitively using the mouse wheel button and the mouse wheel to expand or reduce molecular clusters, grow or cut polymers, or blow up or shrink coordination spheres around the atom(s) under the mouse cursor.